Police investigating the £53m Securitas depot robbery in Kent have found several million pounds following a raid in south-east London. 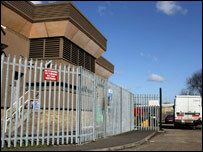 A 43-year-old man was arrested at industrial premises in Welling on suspicion of handling stolen goods. Bags of cash are now being examined. Money was also found at Elderden Farm, Staplehurst, Kent, but police said it was not a significant amount. A fifth person has appeared in court on charges in connection with the heist. Lea John Rusha, 33, from Lambersart Close, Tunbridge Wells, Kent, was remanded in custody until 13 March accused of conspiracy to commit robbery. Thursday's raid on a car repair business in the industrial yard in Welling was a joint operation involving officers from Kent and the Metropolitan Police. A statement said the amount of cash recovered was not yet known. The owner of ENR Cars, known only as Nigel, said he had sub-let half the yard to someone else and the news had left him "totally dumbfounded". Speaking to the BBC from Spain, where he and his family are setting up home, he said he had contacted Kent Police and was waiting for them to call him back. "I've got nothing to hide - it's absolutely nothing to do with me," he said. He added he was due to return to the UK on 25 March, but was prepared to come back earlier to talk to the police. There were also reports on Friday that officers were searching a car showroom on the A26 Tonbridge Road in the village of Wateringbury, just outside Maidstone. However, Kent Police refused to comment. Earlier on Friday, Jetmir Bucpapa, 24, of Hadlow Road, Tonbridge, Kent, appeared before magistrates also charged with conspiracy to commit robbery. He was remanded in custody to appear at Maidstone Crown Court on 13 March. Three people who appeared at Maidstone Magistrates' Court on Thursday on charges linked to the raid were also remanded in custody until that date. John Fowler, 60, from Kent, is accused of conspiracy to rob, handling stolen goods and kidnapping depot manager Colin Dixon, his wife and young son. Stuart Royle, 47, of no fixed abode, is charged with conspiracy to rob, while Kim Shackleton, 38, from Kent, faces a charge of handling stolen goods. Mr Fowler, a car salesman of Elderden Farm in Staplehurst, Mr Royle and Ms Shackleton, of Allen Street, Maidstone, will all appear for a preliminary hearing on 13 March. A 14th person arrested in connection with the raid on Thursday in Crowborough, East Sussex, was released without charge, along with a woman also held on Thursday. 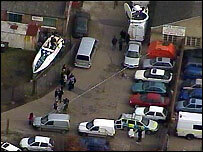 The raid, Britain's biggest cash robbery, happened at the Securitas depot in Tonbridge, Kent, in the early hours of 22 February.